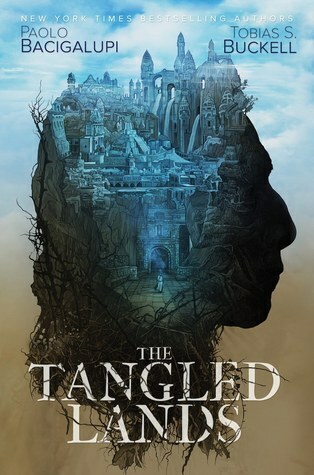 A couple things I didn’t realize when I first picked up The Tangled Lands: one, the world featured here was in fact introduced back around 2011 in the Khaim Novellas series, consisting of The Alchemist by Paolo Bacigalupi and The Executioness by Tobias S. Buckell. Two, this book actually turned out to be an anthology of sorts, containing four short stories which include the aforementioned two novellas. All four pieces take place in a shared world so there are some related events and characters, but generally speaking, they are each distinct and standalone. After scouring my copy of The Tangled Lands, I couldn’t find this information about its format mentioned anywhere on the dust jacket, so hopefully my review will help readers decide if this is the type of book for you. Personally, it wasn’t until I realized that I wasn’t reading a traditional novel but in fact four separate stories, that I felt better able to gauge my opinion of the book as a whole. First up is the tale of the alchemist, a beleaguered man whom despite his hard work and genius is seeing his life falling to ruin. This opening story also introduces the world to the uninitiated—it takes place in the city of Khaim, the last remaining city in a fallen empire that has been choked by a fast-growing kind of bramble that feeds on magic. As a result, any kind of magic has been outlawed to prevent the bramble from encroaching any further, though some still risk their lives to use it when faced with no other options. This, unfortunately, is the situation our hapless protagonist finds himself in when his only daughter is infected with the seeds of the bramble, causing a lung disease that will one day claim her life. To save her, the alchemist must perform a magical spell regularly to heal her body. But the alchemist also knows that he cannot keep this up forever. The problem is the bramble; if it can be destroyed for good, magic wouldn’t be prohibited anymore, and his daughter would live. So, he devotes all his time and efforts into developing a bramble-killing device called a balanthast, which he brings to the city leaders once it is complete. However, that’s when everything goes wrong. Of the four stories in this book, this was probably my favorite. Part of it was being introduced to this world for the very first time, I’m sure, but there were also a lot of subtle nuances to be found here, from meaningful messages to deep questions to chew on. The Alchemist is very much a Paolo Bacigalupi story in that sense; I can always count on him to present interesting perspectives and provide plenty of discussion fodder. I also enjoyed the characters here. Regardless of what you think of his motivations or actions, the alchemist is written in a way that allows the reader to understand his dilemma and sympathize with him. The second story is The Executioness, written by Tobias S. Buckell to accompany The Alchemist. In Khaim, those who are caught using magic are immediately put to the axe in a public beheading. Our protagonist in this tale is Tana, the city’s only female executioner, forced to take her father’s place and carry out his gruesome task on the chopping block. But after a brutal attack on her home by foreign raiders, she must embark on a difficult quest to save her children. I have to say this one was a rather humdrum in terms of the plot—Tana gets picked up along the way be a group of fighters who are tracking the raiders, and she learns to use her executioner’s axe in combat, becoming an effective leader in the process. What stood out for me was the unique role of the protagonist, an executioness but also a middle-aged mother. Sadly, this latter aspect of her life was not as deeply explored as her time with the army, which I thought was a missed opportunity. We also didn’t get to see a lot of the world-building in this one—another disappointment considering how well done it was in the previous story, with its amazing look at the magic system. Written by Paolo Bacigalupi, this tale begins what I would call the “aftermath” phase, showing the consequences of the events from the two previous stories. We now know the full effects of the bramble. Beyond breaking down infrastructure and society by bursting forth from city streets and sprouting in farmers’ fields, it also poisons people and make them sick—very sick. In this story, a young man fights to keep his sister alive after she succumbs to “bramble sleep”. But how far will he go to save her, when resources begin to dwindle, and the hope fades every day? Unfortunately, for a story with such emotionally harrowing themes, this was another one that I felt missed its mark. Rare for Bacigalupi, the characters here just didn’t engage me, so I didn’t feel as connected to this story as I wanted to be. It was also the shortest tale, and that might have hurt it, being that there was not enough time to adequately develop the characters or the plot. After all, for a story of this nature, that’s rather important. This closing tale by Tobias S. Buckell probably ranks as my second favorite in this collection. While it is dark and bleak, I nonetheless enjoyed it because of all its different layers. In this story, a blacksmith and his family are given only a fraction of the resources required to forge a set of armor for a wealthy duke’s son. The duke, fully aware of the unfairness in this situation, punishes the parents when they fail to deliver, thus forcing the couple’s daughter to complete the project or see her mother and father perish. However, the girl has her own plans, and risks everything to save her parents. This one did not end the way I expected, and though it was also tough to read about the pain, suffering, and injustices committed by the elites on the serving class, I also enjoyed the unpredictable way this story unfolded. I also felt for the main character, my heart aching for her and the circumstances she has found herself in. Even though she was powerless, she still found a way to fight back, never giving in despite the hopelessness and impossible odds stacked against her. Final Thoughts: The Blacksmith’s Daughter was perhaps a rather grim note to end the book on, but in a strange way, it also felt appropriate. Other than taking place in the world, the four these stories here are unlinked or can be read separately, and yet, a common theme does run through all of them. The concept of family features strongly in each tale, not to mention a central figure who sacrifices a great deal in order to save a family member. That said, it didn’t feel like much was accomplished by the end of the book. These tales read more like mini vignettes following the triumphs and tragedies of the different characters—little slices of life in Khaim. It’s a neat idea, but going back to what I wrote at the beginning of this review, if you want to avoid disappointment, it’s probably best to consider The Tangled Lands an anthology rather than a novel or even a collection of constituent short stories that make up a whole. Interesting. I was intrigued by this book but now I’m not so sure whether I should pick it up. I only read the windup girl by Paolo B. and it was pretty good. Super weird, but in a good way. I’ve been meaning to read more of his stuff 😀 This one sounds pretty weird / good too, and i never heard of the other guy, so maybe i’ll discover another author to look out for. Ok, now I sort of wish I hadn’t requested this. I read The Alchemist years ago (when it first came out) and did not enjoy it. I had no idea it was part of this book! But maybe a reread with other interrelated stories will change my mind about it. After all, it was your favorite! Yeah, I’ve never read this author but I don’t think this would be the starting point for me as short stories don’t really work that well. A common background should have given firmer roots to these stories, but it would seem not to be the case here – although,as a “consumer” of short stories, I’m interested to see for myself how these two authors managed to blend their individual skills in creating this intriguing world. That’s a tad disappointing to hear, especially considering how incredible that cover is. I have it on hold at the library so I’ll still try a couple of the stories! I hope you enjoy the book! The stories themselves really aren’t bad! I just wish I had been forewarned I was going into an anthology of sorts. I love short fiction, but I’m a little put off by it not being obvious that the book is comprised of separate tales. 😦 I feel like a lot of people are going to be disappointed by simply not knowing what they were getting.